The list of Chao Phraya River piers shows the piers, related landmarks and attractions to help in planning your Bangkok sightseeing tour on the river of kings. The Chao Phraya regular river boat service operates everyday from 0600 – 1840 hours serving all these piers except N 2 Wat Muang Kae. Only 32 of the 35 piers are mentioned here. The three piers south of Sathorn have been omitted as they're out of the way. Use the pier numbers to help identify the piers and to communicate with the staff if you have problems with the names. I have included landmarks and attractions that are within walking distance from these piers. Please note that the Chao Phraya river boats don't stop at Wat Arun and Wat Rakhang on the Thonburi (west) bank. Another ferry crossing is required. Just click on the links for the details of these Bangkok legacies. 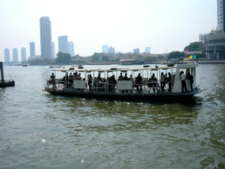 Chao Phraya River piers in Bangkok, their landmarks and attractions. 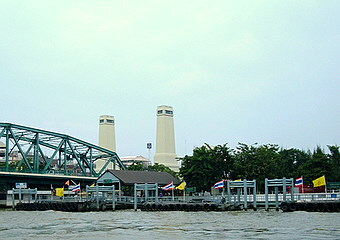 Some of the piers are in Thonburi, the former capital before Bangkok, on the west bank of the Chao Phraya River. 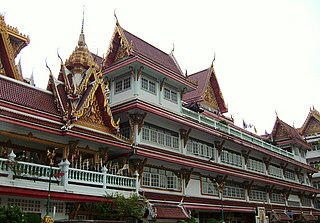 Today, Thonburi is administratively part of Metropolitan Bangkok. Unless stated otherwise, all piers are on the Bangkok (east) bank. 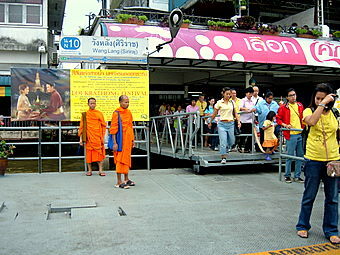 Sathorn Pier – suggested start point at the Bangkok skytrain station at Taksin Bridge. N 6 Memorial Bridge (Saphan Phut) – Twin bridges Memorial Bridge - Phra Pok Klao Bridge, King Rama I Monument Pahurat Little India. 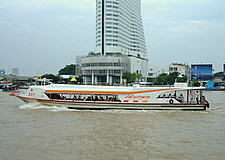 N 7 Rajinee – boat passes Fort Vichai Prasit and Wat Arun on the Thonburi bank. The ferry to Wat Arun is from N 8 Tien Pier. N 8 Tien – Wat Pho Saranrom Park and the ferry to Wat Arun. Chao Phraya River piers in Nonthaburi a province just north of Bangkok. Like Bangkok, Nonthaburi straddles both banks of the Chao Phraya River. As we leave the city center, the scenery changes and this is an opportunity to see village life on the river banks. N 24 King Rama VII Bridge, (west bank) with the King Rama VI Railway Bridge alongside. 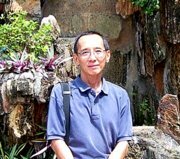 N 25 Phibun 1, N 26 Wat Khema, N 27 Wat Tuk (west bank) N 28 Wat Kien (west bank), N 29 Phibun 2 near the King Rama V Bridge, N 29/1 King Rama V Bridge (west bank). These piers serve little communities living near the river banks. Some piers are named after neighborhood temples (wat) near the piers. 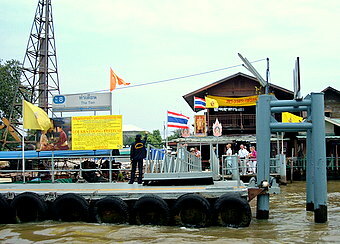 N 30 Nonthaburi – terminal pier, where the Museum of Nonthaburi is located. 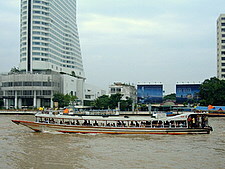 The trip from Sathorn pier to Nonthaburi takes approximately 1 hour and 15 minutes. Print out this list of the Chao Phraya River piers to help in your orientation during the river cruise in Bangkok and pleasant sailing.